HOW BIG ARE POWDER POST BEETLE EXIT HOLES? WHAT ABOUT BEETLES FLYING AROUND MY HOUSE? Most people fear that termites will infest their home and this fear leads them to spend thousands of dollars on pest control to prevent this from happening. Yes, it is true that termites may find a meal at your house. But they are not the only pests ready to eat your house. Powder Post Beetles and other wood eating species are another insect you need to fear. Powderpost beetles includes a wide range of subspecies all of which eat and live in wood commonly used for construction. Some of these species include lyctidae, anobiidae (anobid), bostrichidae. In the “other beetle” species some common names include Old House Borers, round headed borers, buprestid beetles, ambosia beetles and bark beetles. Other wood destroying pests include Bamboo Borers, Wood Boring Weevils, Bark Borers, Furniture Beetles, Steely Blue Beetles, Deathwatch Beetles, False Powderpost Beetles, Sculptured Pine Beetles and Wharfborer Beetles. The bottom line is the list of wood destroying beetles present in the United States is well over 50 and probably closer to 100 at this time. The significance of this is that many of these species can and do feed on both hardwood and softwood. This means an active infestation found in your hardwood floors could easily lead to a problem in your pine book case or your walnut table. The point is the old list of powderpost beetles has definitely changed in recent years and the more we import foreign wood and furniture, the more this list will grow. The end result will be a much broader range of beetles many of which will be quite capable of infesting both softwood and hardwood. This article will explain what to expect should you discover an active infestation and then offer ways to control local infestations. Before we get to the different sections, I would like to explain some general biology of these pests. By understanding their life cycle, you will be able to understand why we do certain treatments for control. Please remember this article is not intended to discuss in great detail the different species of powderpost beetles you may encounter. We have described the general biology which pertains to many species and subspecies so you will be able to understand these types of insects better. Time periods for development, longevity of infestation, specific behaviors and reproduction cycles are only outlined with the intention of giving you information so you can determine whether or not you have such pests, how you should treat the infestation and what products to use. The scope of this article is to provide the basic facts and guidelines so individuals inclined to do their own pest control may do so with confidence in what they doing, why they are doing it and what products to use. Although an unprotected structure is a target for unwanted pests, powder post beetle infestations are more likely to be in wood which is used for construction. This includes wood used for log homes, conventional homes and furniture. Most wood today is milled, kiln dried and sometimes even treated. However, the egg and pupae stages of these insects seem to prevail. Powderpost beetles have many sub species which have different time tables for development. They all start from eggs, but the time it takes for the egg to go through its stages varies on the species. It is not uncommon for wood used to construct a log home to have adults emerging any time from one to ten years later! This wide range of development further complicates diagnosis time and may lead you to ignore the severity of the problem. The cycle, like any other insect, is egg, larva, pupa and then adult. When the egg hatches, a little grub crawls out which eats cellulose. This grub is what causes all the damage. Once it gets it’s fill, it will undergo metamorphosis and then emerge as the adult. If powderpost beetles are what you have, expect to see tiny little holes and in some cases channels where they have chewed their way through the wood. In most cases, it is the adult emerging which people witness. First they see a fine powder, like talc powder, and then they see small holes. THESE HOLES ARE ACTUALLY EXIT HOLES WHERE THE ADULT HAS LEFT !!! This point is so misunderstood that I feel it is important to state it again….THESE HOLES WHICH YOU ARE SEEING IN ARE ACTUALLY EXIT HOLES WHERE THE ADULT HAS LEFT! A trained eye is usually capable of finding the adults as they tend to accumulate around windows and lighted areas. They are small, about 1/8 ” and appear to be reddish brown in color. It is not unusual for an infestation to generate several hundred of these adults during a short period of time. They are seeking a good place to mate and lay eggs to continue their cycle. Here is some powderpost beetle damage to a 2×4 piece of lumber. Here is a picture of damaged paneling, both front and back. Since many people find larger holes in their homes, we commonly get asked what could be causing such damage. The answer is a closely related boring beetle. Old house borers are larger and therefore create larger exit holes. They are most commonly found in softwoods such as pine. Their cycle is like a powderpost beetle in that the larva is what does the damage. Their exit holes are huge, however, and cannot be missed. Expect to find them in attics and crawl spaces. 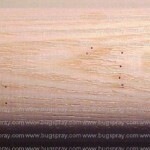 There are many species of old house borers and they come in several colors and sizes. Their hole size will vary accordingly so don’t worry if what you’re seeing isn’t an exact match; exit holes can be barely larger than a pin hole or as large as a dime. The most important thing is that their cycle is the same as powderpost beetles. And since the larvae feeds on wood, the treatments and products used will be the same. Here is a 2×4 with some exit holes from old house borers. To solve a problem with either powderpost beetles or old house borers, you must stop the larva. This is done by using a material which penetrates wood. Once in the wood, feeding larvae will ingest some of it and die. Remember, the larva stages of these pests develop from the inside out. To control them, you need to get where they start. The second key to control is using a product which will last. Although it is easy to kill the larva which are feeding, eggs that hatch months or years later must be stopped. A product with a long residual will provide such control. This residual will stop the current infestation as well as protect against new invaders should they find their way to your home. It is important to understand that most species of these pests are dependent on a particular type of wood when first discovered. For example, if you first find them in hardwood floors, the adults that emerge would try to lay eggs on a similar type of wood. But the vast majority of powderpost beetles and other wood destroying beetles worldwide can live in any kind wood. If the emerging adults can’t find a good new supply of their “preferred” wood of choice, they’ll readily choose whats available. For example, if a piece of cherry furniture has some powderpost beetles, the emerging adults will try to infest other areas of the same furniture. Now if they can’t find good cherry to feed upon but you happen to have ash, hickory, oak or other hard wood in the home, it could very well become a target. And depending on the species, they might instead choose a softwood to continue nesting on so don’t ignore any pieces in the home when trying to anticipate where they might end up. Look for wood which is vulnerable and untreated first. The chances of these beetles cross breeding is now as likely as ever due to the ever broadening range of furniture we import here in the States. Unfortunately all this exotic furniture made in far away lands will contain exotic beetles and some of these are quite capable of adapting to their new environments. Now that you have a basic understanding of powderpost beetles and how they develop, lets examine more specifically the type of infestation you are experiencing. Each section will describe in some detail the nature of the infestation and how you need to control it. Choose the type of infestation you would like to learn more about and then click on it to link to that part of our article. You can also scroll down the page to get there as well. Log homes are being constructed throughout the United States in record numbers. These homes are prone to natural attack as nature tries to recycle the dead cellulose. These recyclers are ever present and represent themselves in the form of carpenter bees, carpenter ants, termites, decay fungus and powderpost beetles. Although most lumber companies and log home construction companies are treating wood before construction, there appears to be many infestations still active which leads to problems years later. No one knows if the treatments need to be increased or if the material being used is simply not penetrating the wood deep enough. Whatever the reason, log homes are being constructed with active infestations which don’t reveal themselves until years after construction. At this point the logs have usually been treated with stains, paint, lacquers and sometimes sealers which will make treating them difficult. If an infestation is discovered after construction, the use of a penetrating material such as BORACARE is needed. Boracare has the ability to penetrate 2-4 inches of wood and will be lethal to feeding powderpost beetle or old house borer larva. It lasts a long time and acts as a stomach poison to feeding larva. It will quickly stop the chewing, but adults may still be seen for a while until all developing pupa have hatched. Boracare needs untreated surfaces in order to penetrate. If the wood has a polyurethane finish, don’t waste your time trying to treat. Nothing will get through such a finish. However, stain by itself will not stop Boracare from penetrating. If it has weathered for a year or two, than applying Boracare before you next apply some stain would be best. Even though it may penetrate up to 4 inches, it will help if you are able to treat on both sides of the logs. This will insure maximum coverage and penetration. Boracare is absorbed quickly into the wood, so it only takes 24-48 hours to cure. This means that it should not be a major inconvenience in the home waiting for it to dry. But if the home has a strong finish on the outside and nothing on the inside, you may have to treat the inside several times and hope that you can get deep penetration. Remember, even though you may only see a small area where exit holes exist, try to treat as much of the home as possible. Many times a spot treatment will resolve a localized problem area but then other areas of the home are found to be infested. To insure complete protection, treat as much as you can. Remember, the adults emerging are only a symptom of the problem. The real problem are any feeding larva. You could only treat the area where the adults have emerged, but this would prove to be short sighted and not the best idea. A better approach is to apply as much as needed to treat the entire area which may have activity. This attitude will save you money and time in the long run. Another product worth mentioning is called TIMBOR. Many professional applicators like to use this material when treating for borers and powderpost beetles. It costs less to use than Boracare and I expect this is the main reason why it is the product of choice. If are having your home treated by a company and they want to use Timbor, insist on having them use Boracare. It will cost you more, but you will get a lot more protection for your money. Timbor is fine for prevention and provides a surface protection that most wood destroying organisms will not be able to penetrate. However, it does not absorb as well as Boracare and therefore may not kill off eating larva. To kill the infestation as quickly as you can, use Boracare. If you have logs you want to protect that do not have insect activity, you can use Timbor effectively. The only difference between the two is that Boracare will penetrate better and Timbor is more likely to leave a white residue. 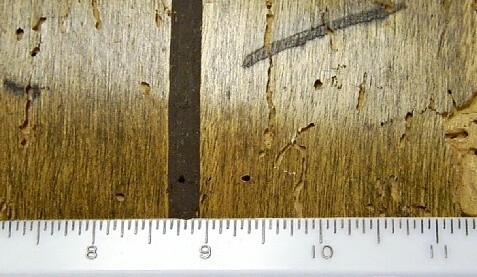 Boracare dries invisible but because Timbor is a wettable powder, it can be seen on many wood surfaces after it dries. In finishing this discussion about these products, it should be noted that both use boron based active ingredients. They are relatively safe compared to many household cleansers and detergents. Neither product has an odor and cleanup is easy when working with them. They both can be applied with a standard PUMP SPRAYER, but be sure to use one which has a spray pattern which is flat and sprays a swath that is similar to using a paint brush. This insures uniform coverage and equal distribution. Many spray tips do not release a nice, fine spray and the application is rough and splattered. 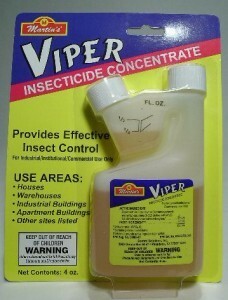 For most standard insecticide applications, this is acceptable. For Boracare or Timbor, you need smooth and equal distribution of the finished spray. Like log homes, conventional homes can have an infestation of powder post beetles brought with the original wood used for construction. Structural lumber such as studs, sill plate, floor joists and rafters all can have infestations which do not show themselves until several years after construction. Treatment of these areas is generally easier than treating a log home because the wood is usually exposed and unfinished. Such structural wood is usually thinner which allows for quick and complete penetration as well. Again, BORACARE should be used where you have activity and TIMBOR can be used to protect wood away from the infestation. If the area is prone to constant moisture exposure or if you just want to protect the wood surface from any chance of mold growing, use the BORACARE MOLDCARE. Basically this is a jug of Boracare with the additive Moldcare conveniently included. Both are added to the tank mix and combined will provide the best surface overall protection possible for any kind of wood. Any of these applications should be done with one of our SPRAYERS and once again treating more than the suspected infested wood is suggested to insure you get complete coverage. When spraying rafters and roof sheathing, use goggles. Although the runoff isn’t likely to hurt you if you get it on you, it is wise to wear rubber gloves and eye protection so you don’t have to run off and wash yourself every time some splashes on you. If you suspect you have activity in wall voids below attics or above crawl spaces, you have a couple of options for treatment. The first would be to remove wall coverings like paneling or sheet rock. Once open, you would have direct access to studs and sheathing allowing for direct treatment with Boracare. This should also be done if you are renovating a home and plan on exposing certain walls or ceilings. Treat them when you will have the area exposed and once treated, you won’t have to worry about it again. These areas are protected from the sun and rain so treatments last a lifetime. However, if you don’t intend on removing wall coverings, you should still consider treating. This can be done with one of our FOAMING TOOLS. 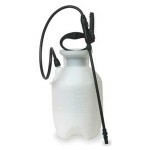 This device is like a standard pump sprayer but instead of pumping out a liquid, it creates a foam. When pumped into wall voids, this foam can be used to carry the Boracare to all sections of the void. Such coverage is not possible if you simply spray a liquid into such voids; liquid sprayed into wall voids simply runs down to the bottom and you end up with very little area treated properly. When foamed, voids get complete coverage with little mess. The foam is much dryer than water alone so you are able to get better coverage, less mess and a lot less preparation since you don’t need to open walls to do such work. You will need to get some FOAMING AGENT to mix with the Boracare in the Tool. It is also best to mix the Boracare first in a bucket before you add it to the sprayer. Once in liquid form, pour the material into the foamer, add the foaming agent and then go to work. The Tool comes with several nozzles so you only need a small hole through which you can foam large areas – perfect when you want to keep a wall cosmetically in tact. If a crawl space is the area of concern, you may be having a problem with moisture which can lead to decay fungus. Although Boracare is needed for penetrating, using another product called TIMBOR will work well for surface treatments and should be considered for preventative applications. Timbor does a good job of preventing powderpost beetles as well as decay fungus and is recommended to apply as a precaution to stop such problems from developing. 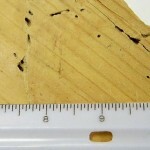 Structural members will stay intact longer and resist rot and insects if treated with Timbor. In this case, the ability of Timbor to stay on the surface acting means it can help protect the wood of decay fungi, mold and mildew. It has been demonstrated that if you reduce decay fungus you will reduce insect infestations. Use one of our Pump Sprayers along with the optional Spray Wand to get good coverage a uniform treatment. However, if the space is not readily accessible, use a BG FOGGER or FM6309 FOGGER for the job. This device is excellent for jobs where you are not able to get close enough to spray the wood you want to treat. 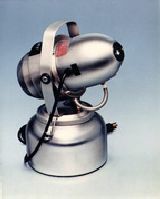 This Fogger is able to propel the material 50 feet or more allowing for the treatment of many crawl spaces and attics which would otherwise be virtually impossible to access. In some cases, powder post beetles will infest furniture. Again, this is mostly due to wood being used which has some stage of the pest already in it at the time of construction. I have seen dressers, tables, chairs, cabinets, statues, trophies, couches, desks, wall units, artwork, picture frames and other wood objects experience this problem. The good news is you won’t have to pay for expensive fumigation (which can cost thousands of dollars!) to get control of this boring beetle. In most cases you’ll be able to take care of the problem at a fraction of the cost and in the end, get the piece treated in a way that will last for many years. So how is it that furniture gets infested? Well, most people find out there is some kind of borer problem when they start seeing “exit” holes in a newly purchased piece of furniture. As explained above, these are the holes adults make after hatching from pupae cases deep inside the wood. Hatching pupae release full grown adults that will instinctively want “out” of the wood so they can seek a mate. Once out in the open and mate is found, they’ll come back to the area looking for a good place to lay eggs. This means if you find wood with newly appearing exit holes, you need to take some action. Regardless of the furniture type, the best way to treat the piece is with BORACARE. Unfortunately Boracare needs at least one unfinished side in order for the treatment to work. This is because it can only be absorbed through unfinished surfaces. So if the piece infested has a lot of stain or some kind of exterior finish like varnish with no large, unfinished sections, a Boracare treatment is probably out of question. For finished furniture that’s thoroughly protected, you’ll either have to strip the wood of it’s finish or apply JECTA GEL. The use of Jecta Gel is a good option when you have a piece of furniture that cannot be stripped of it’s finish. In a case like this, you’ll need to drill holes in the piece so that Jecta Gel can be applied. Once the holes are drilled, inject the gel into each one taking care to make sure the placement is complete and uniform. Once injected, the gel will permeate through out the wood and ultimately get it protected much the same as if Boracare was used. It’s important to understand you will need to drill a lot of holes when using the Jecta Gel but in many cases this can be done without jeopardizing the integrity of the furniture. More importantly, after the treatment all the holes can be filled with wood dowels and finished so that cosmetically there is no need to leave any sign a treatment was even done. Powderpost beetle infestations of similar pieces can be a problem anywhere in the country. With the increase of antique furniture being used in contemporary homes, existing infestations are being distributed to new homes as well as antique galleries, museums and schools. Additionally, we are importing more and more foreign furniture and with it a lot of new beetle species. Although antiquing can be exciting and rewarding, be wary of powderpost beetles when looking at something you want to purchase for use in your home. Be sure to treat any furniture that has evidence of activity – even if you are unsure if the evidence is active or something old. This preventive treatment could prove to save you from the much larger cost of having to treat your entire home because it got infested due to that “old dresser you got from Grandma’s”! Don’t think the stain or varnish you plan on using will “kill those woodworms”. Those “woodworms” are buried deep in the legs and sides of that old furniture and even if the fumes of the stain you applied were able to kill all the exposed stages, eggs and pupae will prevail and continue developing! Nature has equipped these stages to endure a lot of extreme exposures as a way to insure powderpost beetles are able to continue and help recycle cellulose. If you want to break this cycle, you’ll have to treat it. To treat such wood, you need to use a product which will penetrate throughout the frame and insure all stages of the beetle or termite are killed. We have three products which are designed to do this. The simplest method is to use an aerosol called D-FORCE AEROSOL. This aerosol comes with a straw applicator and when applied to the galleries, exit holes and windows of the damaged area will kill larvae and adults on contact. 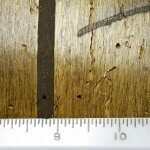 It does not penetrate so it will not work well when treating wood which is more than 1/2″ thick. Also, it doesn’t provide much residual so eggs which hatch in a month or two are likely to survive. To insure a more thorough and complete treatment, it is recommended that you use one of the other materials we have like the BORACARE or JECTA GEL. Dforce is good for small pieces such as baskets and wreathes. You can apply it on a regular basis to make sure you break the cycle of whatever is living. If the piece is too big or you don’t have the time to make repeat applications, read on. The Boracare concentrate is a great option and can be mixed with water and applied by spraying or painting. It is clear, odorless and needs to be applied to unfinished wood. It will penetrate up to 4 inches and once embedded will kill existing larva as well as new ones hatching later. Most dressers and cabinets need to be treated from the inside as the finish on the outside will prevent the Boracare from penetrating. If the piece is completely finished, such as the leg of a chair or table, you should use the Jecta gel. Jecta is Boracare in a gel form which allows for treatment where the liquid is difficult to apply or use. The gel can be applied to large and small holes you will need to drill prior to the application. Fill the holes with some gel and over time the material will permeate throughout the wood. If drilling small holes you will need to keep them close to each other. Large holes will enable you to place more gel at one location which will insure a better and wider distribution but don’t space them too far apart. Details about hole size and spacing will be found on the Jecta Gel label. In most cases, the gel is used where you are concerned about the cosmetics of the furniture. You will be able to treat with the gel without having to strip the piece which many times is required. If you intend to refinish the wood, apply Boracare to the unfinished surfaces for complete and thorough treatment. With either treatment, you will be able to refinish the wood with stain or varnish and the application will have no impact on how it looks. Over the years of doing pest control, I have had many customers who have problems with newly installed wood floors. The wood used for these floors is usually made of oak although pine is just as likely to be infested. In most cases, the customers notice the problem after the floor has been stained and varnished. This commonly happens 1-5 years after the wood has been installed. Small holes will be seen and talc like powder begins to accumulate where adult beetles are emerging. Like other infestations, I am at a loss as to how this could happen. Since most wood used for floors undergoes kiln drying and some type of treatment, how can anything still be alive and active following these processes? Logic tells us no insect should be alive, yet the wood clearly has an active infestation. This tells me there is a problem with conventional methods of treatment by the wood floor manufacturers or that the product is simply getting infested while it’s kept in storage prior to processing and packaging. I firmly believe very few cases of wood floors actually become infested after they are installed. Unfortunately, most contractors and wood floor suppliers seem to avoid taking responsibility for the problem. In most cases the homeowner is left to solve the problem themselves. This could prove to be expensive depending on how the floor is treated. Let’s talk about your options. 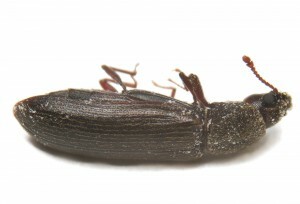 So what are your options if you have powder post beetles in your hardwood floors? One option is to ignore the problem. Most manufacturers will tell you the level of infestation is small and probably will die out within a year. This means you would expect to have adults emerge during this time. In fact, the problem could die out but it’s just as likely to continue. It used to be the vast majority of powderpost beetles were very much wood specific but this has changed. Wood flooring is now imported from all over the world and with these new suppliers comes a whole new range of beetle species. Many of these new species can cross feed meaning they’ll readily choose whatever wood they can find to eat and breed. This means your hardwood floor beetle problem could easily lead to a problem in your pine molding or cherry dresser. The point is ignoring the activity is probably not the best option and a pro active approach will both provide peach of mind and a reason to believe you have a solid line of defense put in place. Additionally, the current problem could turn out to be larger than originally anticipated. If there are thousands of beetles currently in the wood the damage could become significant before the cycle runs it’s course. This means you could experience several hundred to thousands of adults emerging over a year or two and the risk of other areas in the home getting infested would obviously grow and grow as the activity continued. For many homeowners, this in not acceptable. If you are afraid the infestation will not die off, than you will need to treat. In the long run, options two or three will prove to be the better. Option two is to strip the floors and apply BORACARE. Since the infestation is in the wood, you need to use a material which is able to penetrate. If the floors are finished with a varnish or urethane, Boracare will not be able to penetrate without stripping the wood first. Although this could be costly, it will probably be a lot cheaper than waiting a few years and then finding out the floor is so damaged that it must be replaced and that the problem has spread to other parts of the home. We also recommend treating as much of the floor as possible. This will insure no section of it is left unprotected. If you only treat the sections where the beetles are emerging, you may find out later that they are throughout other sections and you will have to treat those sections anyway. If you decide to treat any part of the floor, it makes sense to do as much as possible. Use a good PUMP SPRAYER for the application. Make sure to use one which has a spray tip which puts out a flat fan pattern. This is important when using Boracare because uniform coverage and distribution is required for proper penetration. You don’t want all the spray pooling up in pockets because the spray tip did not disperse it evenly. The third option may be employed if you have a very small section of floor that you want to treat and you are able to access it from below. This would apply to wood floors which are built over a crawl space or a basement. These floors could be treated using a product called JECTA GEL. It’s applied using a caulking gun and is used by squeezing small amounts of it into holes which are drilled into the wood just prior to the application. Jecta gel is used for treating furniture and wood which has a finish that cannot be removed. By making small holes discreetly, you are able to treat furniture and other decorative wood pieces without having to destroy the finish. You can also use Jecta Gel for treating your finished wood floor. This option is tedious but allows you to treat the floor without having to remove the finish as described above in option two. From the basement or crawl space, you must drill up into the subfloor and then through it to the wood floor above. The key here is that the drilling should be done to a pre-measured depth. This depth would be enough to enter the floor boards at least 1/2 inch. 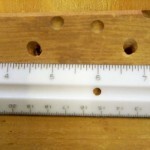 The holes drilled should be at least 3/8 inches in diameter although larger holes would ensure better treatment. Generally, subflooring is 3/4″ to 1″ thick. The flooring is usually 3/4″ thick as well. Once you know the exact width of these boards, you then attach a drill stop on the bit to avoid drilling too deep and damaging the tip of the bit. Holes will need to be drilled every 6 to 12 inches, depending on how big of a hole you drill. Once the holes are all drilled, Jecta Gel is then applied. 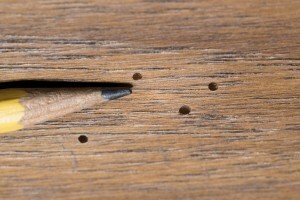 After the holes are treated, use a CORK or wood dowel to seal the hole. For cosmetic reasons, if you push the cork down just below the surface of the wood, it can be sealed over with wood putty and sanded smooth so when the flooring is refinished, the holes won’t be seen at all. Make sure the plug is no longer then the width of the subflooring. This insures the Jecta Gel will be pushed up into the flooring and the dowel will keep it in place. Since the gel takes several months to permeate throughout the flooring, you want it to be in contact with the floor boards. If you don’t cork or seal the holes, gravity will cause the gel to leak out. The fourth option is to have the flooring ripped out and replaced. Many builders and contractors have found this to be a viable solution to the problem. Remember, they will many times rely on word of mouth advertising and the last thing they need is an unhappy customer that’s got a beetle infestation due to the flooring he’s installed! But just because you’re replacing the flooring don’t miss your opportunity to head off future problems in your new floor. Be sure to treat prior to the finishing work with Boracare. When applied prior to staining and varnishing, the Boracare treatment will be quite effective and even if some beetles do emerge a year or two after you get the new floor installed, at least you’ll be able to rest assured knowing the problem won’t be around long. Having the new floor treated will keep it protected indefinitely and in my humble opinion, should be done in most cases due to it’s low cost compared to the installation and finishing cost of most flooring these days. If nothing else, having the wood treated will also provide peace of mind knowing you have in place a strong defense and reason to believe any problem that does emerge will be short lived. The trick to doing this type of treatment is knowing where the holes you are drilling are going and making sure they are going the correct depth. I like to start by drilling at least two holes all the way through the floor. I use these holes to measure a precise grid which will tell me exactly where I need to drill. Remember, you need to treat each floor board. This means that if you are treating a 10 x 10 room, you will need to drill about 1000 holes! How come so many? Well, if you drill every 6 inches, it will take about 21 holes for every 10 foot runner. In a ten foot room, you would have 54 floor boards if standard hard wood runners are used. 54 runners times 21 totals 1334 holes! It would take about 3 tubes of Jecta Gel to do the application. Although this treatment is tedious, you will avoid the added the cost and aggravation of having to strip and refinish the floors. 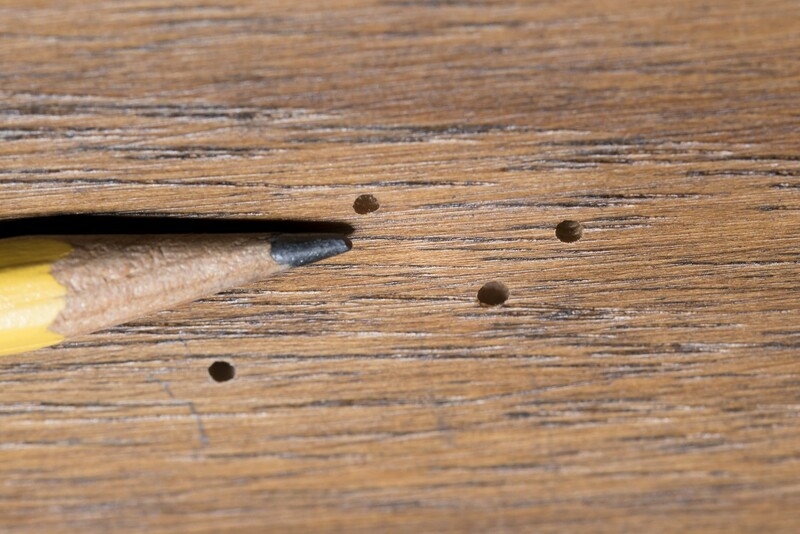 If the wood is unusually moist, you won’t have to drill your holes as close as 6 inches. 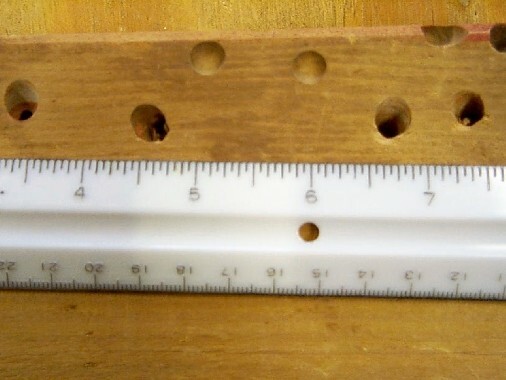 In fact, if the wood is moist enough, you can spread the holes up to 24 inches apart. However, the Gel is very thick and does not penetrate too far when applied to dry wood. 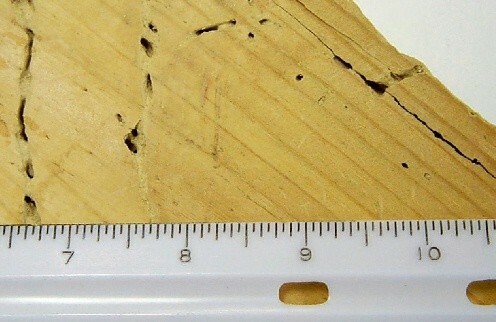 If the wood is dry and not expected to become moist or to be exposed to moisture, than the holes need to be close together. Since there are so many tree boring beetles and borers, it’s worth mentioning that you can control and stop such invasions if you would like to save a tree from premature death. Most all trees can handle a few boring beetles but when the activity gets to be excessive, even the biggest and strongest hardwood can succumb to the damage. In most all cases, the boring damage leads to other issues like more insect invasions, premature water or fungus rot and basically a combination of contributing factors which cause a premature death. Powderpost beetles can infest trees but there are many other species which do this more frequently. Pine borers, longhorn borers and flathead borers are just a few species that commonly infest trees; the list is far too great to include all of them in this article. 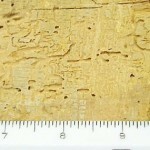 Additionally, both softwood and hardwood trees are vulnerable to this vast populaton of wood infesting beetles. If you find something boring into a tree and feel you want to do some treating to stop the invasion, apply some CYPERMETHRIN with a HOSE END SPRAYER to the trunk and any branches you can reach. Most of the activity should be on the bottom half of the tree and easy to reach. Be sure to treat surrounding trees you’d like protected as well. Chances are high if you have other trees close by they will harbor some of these same insects even though you won’t necessarily see them. Keep a can of PT-CYKICK on hand to spot treat should you see activity in between regular treatments. Most trees will require 2-4 treatments a season; it’s always smart to inspect them through the warm season and spot treat if you see a hole or two. If you keep seeing new activity then it would be wise to do a thorough application with the Cypermethrin to blanket your trees with a good residual all over their bark. Because we get so many questions on this, the author feels it’s important to point out that NOTHING CAN KILL POWDERPOST BEETLE PUPAE. That being said, any pupae present in wood you treat will continue to develop and upon reaching maturity, hatch and exit the treated wood. You might wonder why didn’t the emerging adults die when chewing through the now treated wood? The main reason is that exiting adults don’t eat the wood like powderpost beetle larvae. In fact they’re just chewing through it to get out. And since the treatment works as a stomach poison, it’s not able to have enough of an impact from chewing alone. So how long can you expect to see exiting adults that hatch from pupae after you treat? No one can say for sure. The author has seen where this will commonly occur for 6-12 months following 25-50% of the treatments to wood with significant infestations. He’s also seen where adults will continue to drill out some 1-2 years post treatment and though not common, it does happen in roughly 10-15% of the jobs where all the proper applications were made. So if you’re seeing adults hatching up to two years following a thorough treatment, don’t panic. It’s quite possible these are the final pupae left and eventually they’ll run out. But if this goes on for over two years, there is a strong chance that something is amiss and a re-treatment should be considered. What about the exiting adult beetles? Should you be concerned about where they’re going and what they’re doing? This is very much a legitimate question and concern. Remember, adult beetles exiting the treated wood will no doubt be looking for a mate and a good place in which to lay eggs. Herein lies the potential risk of a new infestation and the reason for some concern. Remember, powderpost beetles can fly. And exiting adults will many times fly off somewhere, fail to connect with another of it’s kind and die. But what if they find a mate? Well, they’ll next be looking for a good place on which to lay eggs. And since powderpost beetles will target similar if not exactly the kind of wood from which they emerged, anything similar cellulose wise in the home is fair game and a likely target. So if you have furniture, molding, paneling or anything else that uses a similar or exact wood species as the species that was previously infested, it could will be a target for pregnant females. But the most likely scenario is that emerging powderpost beetles will target the old wood. This is because the old wood “smells” right. 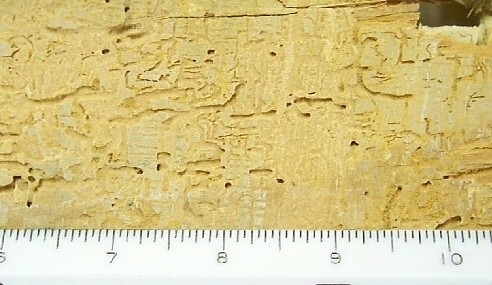 Previous beetle activity, female scent and other pheromones will “mark” this wood making it easy to find for both male and female powderpost beetles. Cracks, crevices and other routes of entry will become prime nest locations along with the newly formed exit holes. In fact, there is a lot of evidence to support the notion that female powderpost beetles seem to like using exit holes for egg laying. Now if the wood was properly treated, this should be no need for alarm. In theory, even if eggs are laid and hatch, they’ll die once they feed on the treated wood. But if you’re unsure about your treatment or if you want a little piece of mind, treat all exit holes and any cracks or crevices you find in the wood (like the joints common to any wood floor) with some PT-PHANTOM. 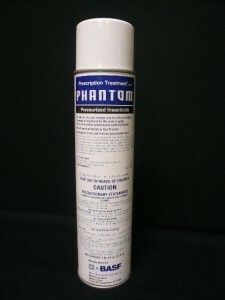 Since Phantom is odorless and goes on dry, you can do some spot treatments without making a mess. And by treating these areas again, you’ll ensure these areas can not become another breeding site. Now since powderpost beetles leaving the infested wood have one thing on their mind (reproducing), they’ll be on the prowl for a mate and after they find one, a good location on which to lay eggs. So if your home has a lot of wood furniture, etc., do some space spraying with PT-PI AEROSOL to insure they’re not successful in this quest. PT-PI aerosol can be used in the home to treat rooms where adult beetles may be attempting to nest. No need to treat the wood directly with this material either; just a few seconds of mist applied to the open air will allow the aerosol to permeate throughout the room and within a few minutes, kill any exposed insects that might be present. Now since it will take several weeks for active beetles to get “hidden” deep in new nests, space spraying will prove to be a good way to prevent any new problems from developing in other areas of the home. Use it daily anytime you have active beetles in the home and want to be sure the problem isn’t spreading. We hope this discussion of powderpost beetles and old house borers has given you helpful information and enabled you to better understand their behavior. If you are going to pay for a service, make sure you get the best treatment for your money. If you are a do-it-yourselfer, using the best products will enable you to get control of the situation and prevent further infestation. After you decide which material will be best for your situation, order on line for extra savings or call on our toll free 1-800-877-7290. You can also e-mail us questions using our contact form link above. Most items are in stock and ready to be shipped on the day they are ordered.